Home > Shop by Brand > Pinnacle Natural Brilliance > Pinnacle Black Label Collection > Pinnacle Black Label Diamond Coating Detailer 32 oz. Pinnacle Black Label Diamond Coating Detailer allows you quickly detail any coated surface while boosting its performance. Pinnacle Black Label Diamond Coating Detailer is the perfect compliment to Black Label�s range of surface coatings, or any type/brand of surface coating. Remove dust, finger smudges, bird bombs and insect splatter safely and completely with the detail spray specifically formulated for surface coatings - Pinnacle Black Label Diamond Coating Detailer. Not all quick detailers are created equal and most will have a negative impact on coating performance. Most quick detail sprays are designed to work on waxed or sealed paint surfaces. They feature waxes, polymers, silicones or other gloss-enhancing agents which can clog the fine texture of a coated surface, temporarily reducing the water beading and dirt-shedding effect. Pinnacle Black Label Diamond Coating Detailer is designed to wipe away completely, leaving only high-quality nano-ceramic glass particles behind. Instead of hindering your coating�s performance, Pinnacle Black Label Diamond Coating Detailer increases it. As the ultra-slick, high-lubricity formula lifts dust, smudges and splatter from the surface, the concentration of nano-glass ceramics (the same base ingredient in all Black Label Diamond coatings) fill in any gaps or microscopic holes in the coating surface. 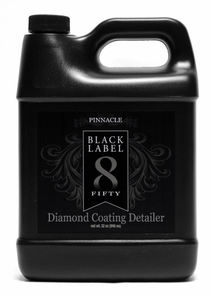 Pinnacle Black Label Diamond Coating Detailer increases your shine and protection while fortifying the coated structure. Use Black Label Diamond Coating Detailer to remove bird bombs and bug splatter, or to remove light dust and smudges between washings. You can also use Diamond Coating Booster after washing to wipe away water spots and revitalize the shine. Coatings detailed with Pinnacle Black Label Diamond Coating Detailer will shine longer, protect better and last longer. Spray directly onto surface and immediately wipe clean with a Gold Plush Microfiber Towel. Flip towel to dry side and lightly buff. This detailing spray definitely works as advertized. I coated my vehicle right after picking it up from the BMW dealer and I must say due to using the Pinnacle maintenance kit, my vehicle after six months shows very little scratching and the shine is amazing. The product is a bit pricy considering you're getting only 32oz. for $80 pre tax, however I just consider this as "the price of admission" for an awesome shine. For the price of this spray detailer I would of expected more. It just is a spray detailer that leaves nothing behind. Which you can get from some cheaper products at 1/3 the price. Because of this I don't think I can recommend this product over any others.